This week's blog comes from Stephen Wallis, a racing enthusiast who works in the Museum shop and galleries. With the world’s premier classic only a few days away it seems an ideal time to remember what happened 100 years ago at Epsom, a race described as “history’s most wonderful Derby” by the following day’s Daily Sketch. Wonderful might not be the best adjective to capture what happened on Wednesday 4 June 1913, dramatic probably being more appropriate. 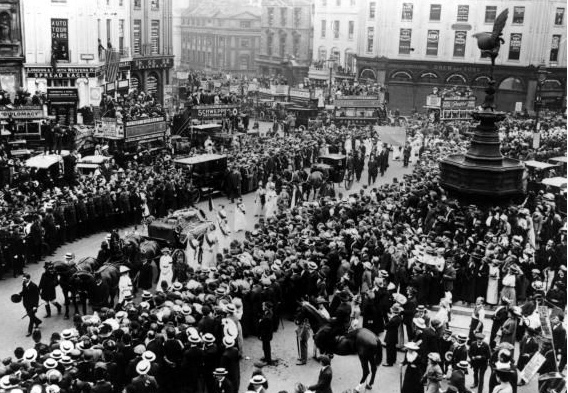 Indeed the race must rank as one of the most extraordinary ever staged in the history of the British turf with the 250,000 crowd gathered on the downs witnessing the tragic death of suffragette Emily Davison while bringing down the king’s horse (Anmer), the first horse disqualified (Craganour), and a 100/1 chance being awarded the race (Aboyeur). However, the first seeds of what happened on that fateful afternoon began much earlier in 1872 when the first national movement, the National Society for Women's Suffrage was founded as women began their quest to obtain the vote. This soon evolved into the National Union of Women’s Suffrage Societies (NUWSS), but after limited success a more militant operation the Women's Social and Political Union (WSPU) was formed in 1903 by Emmeline Pankhurst. The WSPU took a more strident approach to their campaign undertaking more controversial tactics such as arson, vandalism and in general a greater commitment to their mission. Against this background Emily Davison, who had earned first class honours degrees at Oxford and London Universities, joined the group in 1906. 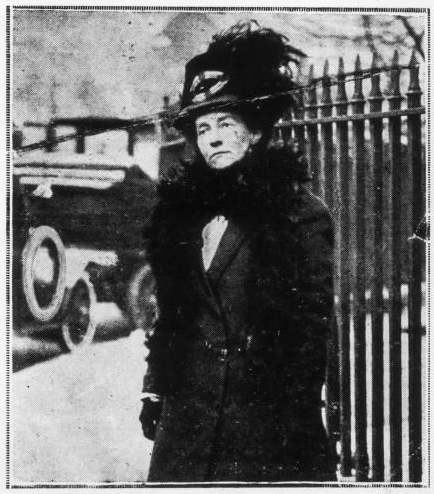 Increasingly Davison became more extreme in her policies to promote the cause of Women’s suffrage, such as setting fire to post boxes and hiding in parliament on more than one occasion, notably on census night in 1911, which meant she was regularly in and out of prison. In Holloway prison (1912) she attempted suicide by throwing herself off a balcony after being subjected to the painful process of force feeding by the prison authorities, as she and the more radical imprisoned members went on hunger strikes. She had become a lone ranger, operating apart from the core group, who were unaware of her intentions as the 40 year old former governess travelled by train to Epsom. The lead up to the race was in itself not without incident and for all Derby’s we must first consider how the main protagonists arrived at the start of the 134th renewal of the premier British classic. Craganour was owned by the son of Thomas Henry Ismay, the late founder of the White Star Line (WSL) and younger brother of Bruce, Chairman of the WSL. The latter had brought worldwide shame on the Ismay family following the sinking of their iconic ship Titanic by, as the American press alleged, cowardly escaping on a life boat while just over 1,500 souls perished in the frozen Atlantic waters. Charles Bower Ismay had purchased the horse at the Doncaster yearling sales for £3,200 and sent him to be trained by Jack Robinson at Foxhill in Wiltshire. Named after a hill on his Scottish shoot at Dalnaspidal, the colt was a brilliant two year old winning 5 of his 6 races and regarded as the best of his generation. As a three year old Craganour was controversially denied victory in the 2,000 guineas at Newmarket by the judge, who the majority believed to be the only person to think Louvois, who was racing on the opposite side, had got up to win. Without today’s technology the judge amazingly gave the race to Louvois by a head. Like Craganour, Aboyeur was sired by Desmond, who was by one of the most successful sires in history, St Simon. Desmond himself had won the Coventry Stakes at Royal Ascot as a two year old and finished 5th in the Derby of 1899. However Aboyeur’s two year old form did not measure up to Craganour and in his seven races before the Derby he had only won once, at his home track Salisbury in the five furlong Champagne Stakes in July 1912. The temperamental colt was trained by Tom Lewis at Druid’s Lodge. The other significant horse on the day, Anmer (named after a village on King George V’s Sandringham estate), was extremely well bred being a son of Florizel II, who was a full brother to Derby winner, Persimmon (1896) and Triple Crown winner Diamond Jubilee (1900). Like Aboyeur, he was unimpressive as a 2 year old and when he lined up on Derby day had only one success to his name winning the lowly Hastings Plate at Newmarket in April 1913. So as the huge crowds gathered on the downs no one could have expected how the day would unfold. Craganour went to post the well fancied 6-4 favourite, with Anmer at 50/1 and Aboyeur at 100/1 providing little interest to the vast crowd with their pennies and half crowns. To add further intrigue to the race William Saxby, the favourite’s 2,000 Guineas jockey, had been replaced by Johnny Reiff, an American based in Paris, who had won the previous year’s Derby on the filly Tagalie, which created bad feeling in the weighing room. Funnily enough the American jockey had ridden Louvois to victory ahead of Craganour in the 2,000 Guineas. The running was made by the blinkered Aboyeur and as the field of fifteen runners came down the hill to Tattenham Corner the scene was set for the tragic events to unfold. 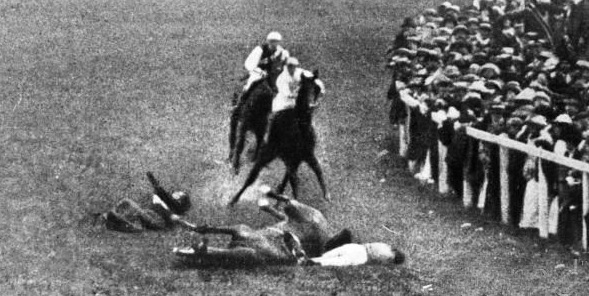 After the leading group had passed Emily Davison emerged from the packed crowds, ducked under the rails and seized hold of the reins of Anmer, bringing the horse and jockey Herbert Jones crashing to the floor. Davison suffered major internal injuries together with a fractured skull. She never regained consciousness and died four days later in Epsom Cottage Hospital. No one really knows if she deliberately set out to kill herself or if it was a brave protest that went tragically wrong. Whatever the explanation many believed, at the time, she could not have singled out one particular horse, King George V’s as she stepped on to the course holding her purple, white and green suffragette scarf, though Clare Balding’s recent Channel 4 documentary Secrets of a Suffragette may have proved otherwise. The royal jockey Jones was concussed and had his arm put in a sling but escaped serious injury. Meanwhile up ahead, three furlongs from home Reiff moved up to challenge Aboyeur on the outside where a brawling struggle ensued. The two of them were involved in a bumping match to the line, though most people saw it as simply six of one and half a dozen the other, with the favourite finishing 1st as four horses flashed past the post separated only by a head, a neck and the same. Controversially although records indicate the call of “all Right” had been made, the stewards themselves raised an objection. No appeal had been made by Aboyeur’s owner, Mr Alan Percy Cunliffe or the jockey. After an enquiry (including evidence from Louvois jockey Saxby) Craganour was disqualified for not keeping a straight course and victory went to the 100/1 shot ridden by the unheralded Edwin Piper. Craganour had now missed out on two Classics, a possible shot at the Triple Crown and his place in the record books. His 2,000 Guineas nemesis Louvois was promoted to 2nd place. One of the stewards was Major Eustace Loder, (the owner and breeder of legendary triple classic winner Pretty Polly) a pillar of the establishment, who had in fact bred Craganour and sold him as a foal and very different to the more flamboyant character Ismay. There were rumours that he bore him a personal grudge, though the Major was one of three stewards, along with Lord Wolverton and former Prime Minister Lord Roseberry, who made the ultimate decision to change the result. Anmer returned to action two weeks later at Royal Ascot without success and later ran behind Aboyeur (who was 2nd) in the Gordon Stakes at Goodwood, finishing 4th. In fact all three thoroughbreds failed to win another race. All the horses eventually moved overseas for stud duties, Craganour being sold to Argentina a month after the Derby for £30,000, where he was a very successful sire, Aboyeur in September to the Imperial Racing Club of St Petersburg for £13,000 and Anmer to Ontario’s Department of Agriculture in 1916. As a result of Davison’s reckless action the cause received worldwide publicity, some of which was not favourable, especially as she had brought down the King’s horse. Her coffin was paraded through the streets of London a few days later with 6,000 women marching alongside, while huge crowds gathered, although bricks were reported to have been thrown at the cortege. Her body went by train to Morpeth, Northumberland where the family came from and 30,000 attended her funeral. Upon the commencement of World War One in 1914, Emmeline Pankhurst instructed the Suffragettes to stop their campaign of violence and support in every way the government and its war effort. The work done by women in the First World War was to be vital for Britain's war effort. In 1918, the Representation of the People Act was passed by Parliament, which allowed women over the age of 30 the vote. In 1928 a further act was passed enfranchising all women over the age of 21. This is just a glimpse of what happened on a Derby Day in Edwardian England a year before the world went mad and changed forever. Interestingly amongst the hoards of people attending the great spectacle in an official capacity was Superintendent William Robinson of the Met Police, the great grandfather of the museum’s curator, Graham Snelling. I am sure he would have a tale to tell about this dramatic day in history.